Coughing up phlegm in the morning can occur with a variety of short- and long-term conditions affecting the lungs. People with a productive cough -- meaning one that leads to expulsion of phlegm, or sputum -- often report their cough is worst in the morning. This occurs because the cough reflex is somewhat suppressed during sleep, which can result in an accumulation of phlegm during the night. Whereas a dry cough commonly occurs due to post-nasal drip from the nose or sinuses, a productive cough most frequently results from a lung abnormality that provokes increased mucus production in the airways. Certain heart, circulatory and other conditions can also cause this symptom. Acute bronchitis is among the most common causes of a productive cough, which may be worse in the morning. Acute bronchitis refers to inflammation of the large- and medium-sized airways, which is usually due to a viral infection. The infection inflames the airways and leads to increased mucus production. 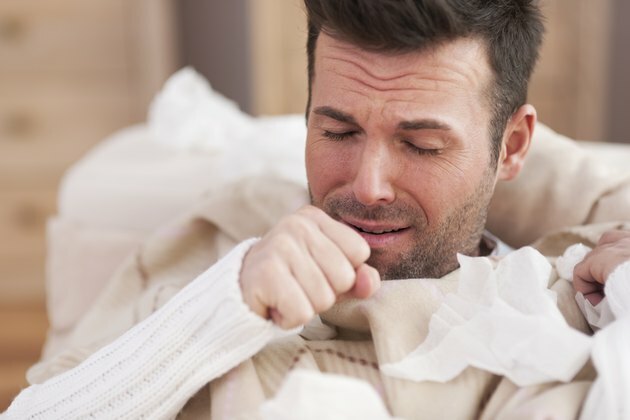 In addition to productive cough, symptoms of acute bronchitis may include wheezing and shortness of breath. Fever is usually absent or low-grade. The cough usually goes away in roughly 7 to 10 days but may persist for several weeks in some people. Since most cases are due to a virus, antibiotics are rarely indicated for acute bronchitis. Pneumonia describes an infection of the smallest lung airways and the air sacs, where gas exchange occurs. Unlike acute bronchitis, most cases of pneumonia are caused by a bacterial infection. Viruses and fungi are less common culprits. A productive cough frequently occurs, which may be worse in the morning. Other symptoms also commonly occur, including fever, chills, shortness of breath, lack of energy and pain with breathing. Antibiotic treatment is the cornerstone of treatment for bacterial pneumonia. Hospitalization and respiratory support may be necessary for people with severe pneumonia. Lung infections other than acute bronchitis and pneumonia can cause a productive cough, although these infections are relatively uncommon. A lung abscess -- a pocket of dead, infected lung tissue -- is one example. This condition often occurs due to accidental inhalation of saliva or stomach contents, or a blocked airway. Typical symptoms include a productive cough with foul-smelling phlegm, fever, chills and possibly weight loss. Antibiotic therapy is the primary treatment. Chronic or recurrent lung infections can cause a condition called bronchiectasis, in which the long-term inflammation leads to airway dilation and mucus accumulation. The condition progresses gradually and causes a chronic cough with thick, malodorous sputum that is difficult to cough up. Other symptoms may include wheezing, low-grade fever, fatigue and shortness of breath. Cystic fibrosis is the leading underlying cause of bronchiectasis. The condition can also occur with other chronic illnesses affecting the lungs, such as HIV/AIDS, systemic lupus erythematosus and rheumatoid arthritis. Chronic obstructive pulmonary disease (COPD) is an incurable lung disease characterized by gradually worsening airflow obstruction. The disease causes destruction of the air sacs, chronic airway inflammation and increased mucus production. These changes lead to loss of lung elasticity, overinflation of the lungs, and decreased functional space for gas exchange. COPD most commonly occurs due to long-term smoking. A so-called smoker's cough is often the first symptom of COPD and typically persists throughout the course of the disease. The cough produces phlegm and is often most troublesome in the morning. Other frequent symptoms of COPD include wheezing, shortness of breath and reduced exercise tolerance. People with advanced COPD may experience morning headaches, weight loss and a severely limited capacity to perform daily tasks due to shortness of breath. COPD management typically involves smoking cessation along with inhaled medications and pulmonary therapy to improve breathing. People with severe COPD often require supplemental oxygen. Pulmonary edema refers to fluid accumulation in the lung tissue and air sacs. This condition can develop for a variety of reasons, but heart failure is most commonly to blame. Heart failure describes a condition in which the heart cannot pump sufficient blood to meet the needs of the body. Common causes of heart failure include coronary artery disease, a previous heart attack, high blood pressure and heart valve abnormalities. Moderate to severe heart failure can lead to backup of blood in the lungs and pulmonary edema, triggering shortness of breath and a productive cough that is typically worst at night and upon awakening. Pulmonary edema with a productive cough can also occur with other illnesses and conditions, including: -- a blood clot in the lung, known as a pulmonary embolism -- liver or kidney failure -- severe fluid overload or water intoxication Although these conditions do not typically cause a morning cough per se, coughing might be more frequent or severe on awakening. A number of other diseases and conditions can cause a productive cough, which might be worse in the morning. Cancer in the lungs, for example, might cause a productive cough -- especially if the tumor is obstructing an airway. Another condition called hypersensitivity pneumonitis is a consideration if other more common causes have been ruled out. With this condition, inhaled bacteria, fungi, dust or chemicals provokes an allergic reaction in the lung air sacs. The illness often develops gradually with symptoms similar to COPD. While asthma may be one of the first things that comes to mind when thinking of causes of a cough, an asthma-related cough is usually dry or produces only a minimal amount of phlegm. However, a minority of people with asthma develop a productive cough. This might be due to another illness causing an asthma flareup or excess secretion of mucus due to poorly controlled airway inflammation. Coughing due to asthma is usually worst at night, but might also be problematic on awakening.